This article is about the American movie theater chain. For the cable television channel operator of the same name, see AMC Networks. AMC Theatres (originally an abbreviation for American Multi-Cinema; often referred to simply as AMC and known in some countries as AMC Cinemas) is an American movie theater chain headquartered in Leawood, Kansas, and is the largest movie theater chain in the world. Founded in 1920, AMC has the largest share of the American theater market ahead of Regal Cinemas and Cinemark Theatres. Starplex Cinemas Eastwynn Theatres, Inc.
After acquiring Odeon Cinemas, UCI Cinemas, and Carmike Cinemas in 2016, it became the largest movie theater chain in both the world and the United States, with 2,200 screens in 244 theatres in Europe and over 8,200 screens in 661 theatres in the United States. AMC Theatres was founded in 1920 by Maurice, Edward, and Barney Dubinsky, who had been traveling the Midwest performing melodramas and tent shows with actress Jeanne Eagels. They purchased the Regent Theatre on 12th Street between Walnut and Grand in downtown Kansas City, Missouri. The Dubinskys eventually changed their name to Durwood, and the company they formed eventually became known as Durwood Theatres. In 1961, Edward's son Stanley H. Durwood took control of Durwood Theatres, then a small 10-theatre chain, when his father died. Stanley had attended Harvard University and served as a navigator in the U.S. Air Force during World War II. He renamed Durwood Theatres as American Royal Cinema on October 1, 1968. During the incorporation process, the name was changed quickly thereafter to American Multi-Cinema, Inc., and Stanley began to apply military management and the insights of management science to revolutionize the movie theatre industry. As he later explained to Variety magazine, "We needed to define what our company was doing in the (exhibition) business. My dad wasn't that organized." It was structured under the belief that every customer was a "guest". Under its new name, AMC opened the two-screen Parkway Twin theatre in a shopping center on Kansas City's Ward Parkway in 1963. This marked the company's first foray into using the multiplex model. According to Variety, Stanley Durwood later claimed in 1962 that he "was standing in the lobby of his 600-seat Roxy in Kansas City mulling over its poor grosses, when he realized he could double his box office by adding a second screen and still operate with the same size staff." The industry quickly embraced the multiplex concept, where additional screens meant very little difference in staff and operating costs but resulted in a significant increase in profits. The concept also provided more film choices at one location, drawing bigger crowds. It also gave owners the flexibility to show big hits on more screens, and less reliance on any individual film that could turn out to be a bust. By the 1980s, the company was experiencing strong growth. AMC had built and was operating a number of 10-screen multiplex cinemas in the United Kingdom, including sites at locations such as Dudley and Tamworth. These were subsequently bought and taken over by UCI. In 1995, AMC pioneered the first North American megaplex, a theater that could accommodate thousands, when it opened the AMC Grand 24 in Dallas, Texas; the first megaplex in the world had been built by European chain Kinepolis in 1988. 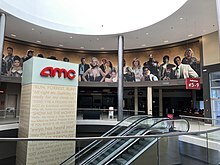 AMC continued to open other megaplex theaters, such as the AMC Hampton Towne Center 24 in Hampton, Virginia, and the chain's busiest theater in the US, the AMC Empire 25 in New York City near Times Square. The largest theaters in the AMC chain have 30 screens, including the AMC Gulf Pointe 30 in Houston, Texas, the AMC DINE-IN Grapevine Mills 30 in Grapevine, Texas, the AMC Ontario Mills 30 in Ontario, California, the AMC Orange 30 in Orange, California, the AMC Cantera 30 in Warrenville, IL (now 17 screens and run by Regal Entertainment Group), and the AMC Forum 30 in Sterling Heights, Michigan. AMC's megaplexes were a success overseas as well. On December 20, 1996, AMC opened the AMC Arrábida 20 in Portugal. In January 2002, the 16-screen Great Northern theatre was opened in Manchester, which was later supplemented by the opening of a 12-screen cinema on the Broadway Plaza site in Birmingham in October 2003. AMC's United Kingdom outlets typically serve a dual function; in addition to the normal cinema functions, they also cater to companies' business conferences which can make use of their projectors for displaying presentations. AMC was acquired by Marquee Holdings Inc. in 2004, an investment vehicle controlled by affiliates of J.P. Morgan Partners, LLC, the private equity arm of JPMorgan Chase, and Apollo Global Management, a private investment firm. At the time, AMC was publicly traded on AMEX under the code AEN. In 2006, the company announced a new initial public offering (IPO), which was expected to be worth approximately $789 million; however, adverse market conditions convinced the company's management to withdraw from such an offering on May 3, 2007. The company filed for a $450 million IPO in its third such filing since 2006 on 14 July 2010. Stanley Durwood died in 1999 and was succeeded by Peter Brown, the first non-Dubinsky/Durwood family member to head the company. Gerardo I. Lopez succeeded Brown as CEO and president on March 2, 2009. Previously, Lopez was the Executive Vice President of President Consumer Products Group, Seattle's Best Coffee and Foodservice at Starbucks. Under new leadership, one of the first major announcements came in March of the same year; the company announced that it would equip 1,500 of its screens with Real D projectors. In the same month, AMC announced that it had closed on a $315 million deal with Sony to replace all of its reel projectors with digital cinema projectors, starting in the second quarter of 2009 and completing in 2012. 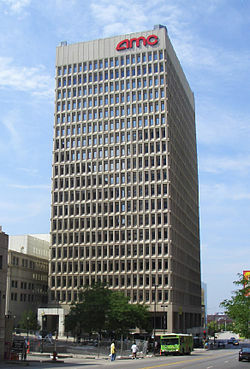 The company used to have its headquarters in downtown Kansas City. In September 2011, AMC announced plans to move its headquarters to a new $30 million four-story building designed by 360 Architecture in the Park Place development at 117th Street and Nall Avenue in Leawood, Kansas in suburban Kansas City. The state of Kansas had offered $47 million in incentives to get the 400 jobs to move. The company continues to officially be headquartered in Kansas City, although it has moved its HQ to the 10 Main Center, where it now leases space. After reaching a settlement with the state of Illinois in April 2012 regarding complaints from a disability rights organization, AMC pledged to equip all of its theaters in the state with captioning and description services by 2014. The disability rights group had accused the company of only providing closed captioning or audio description systems at some of its locations in the state. AMC was acquired by Dalian Wanda Group, a Chinese conglomerate headquartered in Dalian, in May 2012. Wanda Group paid $2.6 billion to acquire AMC's 5,048 screens in 347 theaters in the U.S. and Canada. The deal was finalized on September 4, 2012. The acquisition made Wanda the world's largest cinema chain. Wang Jianlin, CEO of Dalian Wanda Group, announced that the company would plan to spend $500 million renovating AMC Theatres. AMC had eight movie theatres in Canada. In July 2012, four locations were sold to Cineplex Entertainment and two more locations were sold to Empire Theatres and later acquired by Landmark Cinemas. The two remaining locations have since closed. Gerry Lopez announced his resignation as CEO of AMC in August 2015. Craig Ramsey was appointed as the interim CEO by the company board. In December 2015, AMC announced that Adam Aron would be the company's president and chief executive officer beginning January 4, 2016. Aron will also be a member of the company's board of directors. In March 2016, AMC announced it would acquire competitor Carmike Cinemas; in July 2016 Carmike's management accepted a revised offer, pending regulatory and shareholder approval. The deal was closed on December 21, 2016, making AMC the largest cinema chain in the United States. On March 1, 2017, AMC CEO Adam Aron stated that the company would re-brand the Carmike Cinemas locations under the AMC name; smaller locations will be branded under a new sub-brand known as AMC Classic. Aron also announced a plan to re-brand its kitchen-equipped theaters under the name AMC Dine-In. In July 2017, AMC announced they would be cutting $30 million in expenses by the end of the year. This cost reduction will be accomplished by reducing operating hours and cutting staffing levels, and other measures. In 2018 Dalian Wanda Group sold a major part of their stake in AMC to the private equity firm Silver Lake Partners. AMC introduced stadium-style seating, in which the seats are placed on risers so that each person has an unobstructed view of the screen and have adjustable armrests that can be raised to create "Love Seat" style seating. Both of these features have become standard for nearly all movie theaters built today by all major chains. AMC offers a selection of premium formats at various theaters throughout the chain. Not every theater has a premium format offering, while those that do only offer 1 or 2 of the listed premium format offerings. All theater locations are equipped to show 3D films in RealD 3D. This is the entrance to a Dolby Cinema theater located at the AMC Barton Creek Square 14 in Austin, Texas, showing a print of How to Train Your Dragon: The Hidden World. A joint-venture between IMAX Corporation and AMC Theatres, AMC offers IMAX auditoriums at many locations. Often, new IMAX laser technologies are used. Using a format developed by Dolby Laboratories, these auditoriums come equipped with Dolby Atmos surround sound, boasting 5 in-screen speakers, 48 surround speakers, and 4 ceiling-mounted subwoofers; dual-laser Dolby Vision HDR laser projection technology to provide true blacks and a wider and brighter color spectrum; and premium leather recliners which each contain an individual subwoofer that pulses with the low-frequency sounds. Some locations feature video wall entrances that display film-related content provided by the film company. Launched in 2015 to replace the first incarnation of AMC Prime. BigD is a PLF Auditorium that uses a Christie Brilliant 3D flash projector with Texas Instruments DLP projection technology and full surround sound, which offers stadium seating wuth high-back rocking luxury seats with retractable armrests and cupholders. These auditoriums were installed in Carmike locations starting in 2005 under the BigD brand as their non-IMAX premium large format. These theaters become part of AMC’s premium offerings after their acquiring of the now-defunct Carmike Cinemas. Introduced in March 2017, PRIME was designed for smaller locations that cannot support an IMAX or Dolby Cinema system. Similar to the Dolby system, however, these theaters have recliners with film-responsive subwoofers, Dolby Atmos, and high-resolution wall-to-wall and floor-to-ceiling projection. ETX (Enhanced Theatre Experience) is a premium large format used by AMC in select markets, which is currently being phased out in favor of AMC Prime and Dolby Cinema. It was originally introduced in 2009. AMC Entertainment Holdings Inc invested $20 million in virtual-reality arcades and productions: $10 million to virtual reality entertainment company Dreamscape Immersive and another $10 million in a content fund. AMC created the now-defunct MovieWatcher program that rewarded frequent movie-goers similar to other rewards programs but featured innovative aspects. It was based on a points-per-movie-ticket-purchased system, with rewards varying from concessions to movie passes based on point-based level. However, points were limited to a maximum of four points per three-hour time period, which was equal to two tickets. For those AMC cinemas which were not part of the Loews Cineplex acquisition and therefore ticketed by MovieTickets.com, the website's surcharge was waived for MovieWatcher members. On April 1, 2011, AMC started a new rewards program known as AMC Stubs. This program could be purchased for a fee of $12 for an entire year. For that initial fee, each AMC Stubs member woulf receive $5 on every $50 spent between the box office and the concession stand at any AMC theater nationwide. AMC Stubs members also received a free size upgrade with every popcorn and drink they purchase (for example, an AMC Stubs member can get a large popcorn for the price of a regular). Other perks include birthday gifts and waived ticketing fees. An AMC Stubs member could waive the ticketing fees for online ticketing sites such as MovieTickets.com and Fandango. Receipts or ticket stubs were required for manual adjustments. No more than four manual adjustments would be allowed per account in a single calendar month. Manual adjustments would be made for purchases made within 30 calendar days from date of original purchase. As of March 29, 2012, AMC Stubs had 3.2 million members, which represents approximately 18% of AMC attendance during fiscal 2012. In July 2018, AMC Stubs was split into three programs which are currently still in-place, the free AMC Stubs Insider; the yearly fee-based AMC Stubs Premiere, which costs $15 annually and provides the same benefits as the original stubs plus an expedited line at tickets and concessions; and the monthly fee-based AMC Stubs A-List, which allows 3 movie tickets a week to any film in any format for $19.95 to $23.95 a month, depending on the state the member plans to watch movies in. Some AMC locations have a bar service under the MacGuffins brand. These are primarily offered at AMC and AMC Dine-in locations, but some AMC Classic locations with Liquor Licenses offer their alcoholic beverages under this brand. Drinks can be ordered to be drunken in the bar and lounge area or taken into the theater. Some AMC Dine-in theaters have their MacGuffins set up as a full service restaurant that can be accessed without having to pay for a movie ticket. Several types of vouchers may be used at AMC. AMC sells Black and Yellow (formerly Red, Green, Gold, and Silver) tickets, typically priced from $8.50 to $10.25, that can be purchased in bulk at many retailers, like Costco and Sam's Club, as well as at AMC locations. Both can be redeemed towards any movie, but yellow tickets cannot be redeemed in the states of California, New York, and New Jersey. Regardless of the ticket used, surcharges apply for special presentations and premium formats such as RealD 3D, Dolby Cinema, IMAX, among others. AMC, at its discretion, will honor coupons and gift cards at face value. Gift cards are valued at $5 to $100 and can be purchased at AMC locations and at all retailers where gift cards are sold. AMC offers Show Snacks coupons. Some can be exchanged for a small popcorn, while others offer a small fountain drink. The chain also offers similar coupons via SMS or smartphone apps. Older coupons specially designed for the concession stand may be honored by AMC, at its discretion. AMC adheres to its own Rated R policy. Slight differences exist per market, but nationwide, no person under age 17 is admitted into an R-rated film without a parent or guardian aged 21 or older purchasing their ticket and joining them in the theater. Those who do meet or exceed the age of 17 and look under the age of 25 must present a photo ID with name and date of birth to be admitted to such movies. Also, children under the age of 6 cannot attend R-rated showings after 6 pm. Most locations operate under the main AMC brand after the Carmike merger, but AMC introduced two additional brands for their theaters. Along with their main AMC brand, previously AMC has operated locations under the Loews, Starplex, Showcase, and Magic (Johnson) Theatres names, among others, but as of February 28, 2017, have started phasing those brands out along with Carmike's own brands (Carmike, Muvico, Digiplex, Sundance, and GKC) and is unifying them under one of three names. Although the announcement was made on March 1, 2017 one location acquired from Carmike was re-branded to AMC Classic on February 23, 2017, seven days before the announcement. The transition was finished in April 2017. The main AMC brand is being used at most locations and will include premium features such as recliner seating, reserved seating, MacGuffins bars, and large format auditoriums such as IMAX. These locations also have concession stands with "innovative" menus. These locations use the slogan "AMC Amazing" and use the main corporate logo (see top) for their branding. This brand is being used mostly in smaller markets with lower traffic. These locations will function as value theaters and offer a refillable annual popcorn bucket program at those locations. The brand logo for AMC Classic incorporates a re-designed version of the folded "C" graphical element from the Carmike brand logo and the brand will adopt Carmike's "America's Hometown Theatres" slogan. Some locations have been announced to include the MacGuffins bars and Dolby Cinema at AMC Prime auditoriums. Some theatres like Festival Plaza 16 in Montgomery, Alabama, and Palm Promenade 24 in San Diego, California were formerly part of the main AMC brand. In several markets, AMC offers Dine-In Theaters branded as Fork and Screen, Cinema Suites, and Red Kitchen which offer the option to order full meals and alcoholic beverages. They also feature reserved seating with a button located by every seat to signal a server. After the Carmike merger, AMC announced that all locations with full kitchen service will be unified under the AMC Dine-In brand phasing out the current sub-brands and the brands used by Carmike: Ovation, Sundance, and Bogart's. Some locations currently are configured as "Dine-In Express Pick-up" locations where the dine-in menu is offered but the locations lack the table service in the actual theaters  These locations are currently former Sundance Theaters and 2 former Muvico locations that had Bogart's Bar & Grill restaurants attached. These locations use the marketing slogan "Movies with a Menu" and use a logo depicting a fork in a film countdown circle. The AMC Citywalk Stadium 19 located in Universal Studios Hollywood's Citywalk was rebranded under this name in December 2016, and was renovated and had its grand reopening on April 25, 2017 under the new brand. This location includes a seven-story IMAX screen with IMAX Laser and IMAX 70mm Film, as well as "Black Box"–inspired design auditoriums. It has one Christie Laser Projector per auditorium, with Dolby Atmos speakers. AMC has also had some endeavors that did not prove as viable, such as experimenting with 16 mm film for projection and selling microwave popcorn at concession stands in the South several years ago.[when?] They also stumbled by agreeing to install the Sony Dynamic Digital Sound system in all their new locations, rather than the more popular Dolby Digital or DTS systems. While the majority of major releases have all three digital tracks, including SDDS, most independent and smaller-budget films only have Dolby Digital tracks, leaving many theaters in AMC's otherwise ultra-modern megaplexes showing films in analog sound. Recently,[when?] AMC has begun installing Dolby Digital in all new auditoriums, and in 2003 began upgrading selected older auditoriums. AMC announced an agreement on March 26, 2009, to convert 1,500 existing auditoriums to fully digital 3D screens using RealD technology. On March 30, 2009, AMC announced they will convert all 4500 screens in their chain to 4K digital projectors provided by Sony. In competition with IMAX, AMC had begun its conversion at select locations to the 'Enhanced Theatre Experience' (ETX), with the installation of larger screens, 12-channel surround sound, and digital projection (utilizing either Sony 4K projection or Christie DLP technology). 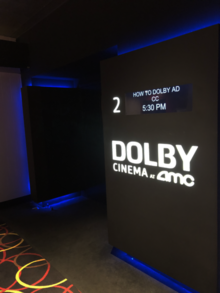 AMC's ETX includes Dolby Atmos in some locations. As of 2016, some of these ETX locations have become Dolby Cinema at AMC locations. AMC also formed a short-lived partnership with Planet Hollywood which failed due to Planet Hollywood's bankruptcy. The Planet Movies by AMC venture planned to open complexes worldwide with the objective of having icon locations in major metropolitan and other select areas, like Orlando and Columbus. Initially, seven existing, unnamed AMC megaplex theaters with more than 150 combined screens were to be re-branded under a license arrangement to incorporate certain elements of the new concept. The initial seven re-branded locations were to include markets such as Orlando, Florida. The AMC Pleasure Island 24 megaplex in Orlando, situated directly across from Planet Hollywood's most successful restaurant and retail unit and adjacent to Disney's Pleasure Island (now Disney Springs) was to be the first Planet Movies location. After the initial seven, the joint-venture planned to own and operate all subsequent units including 8 to 10 complexes with 200 to 250 screens planned to open over the next 18 to 24 months. Over the longer term, the venture anticipated rolling out units at the rate of 5 to 10 per year. From almost the very start, the well-publicized financial strains on Planet Hollywood hindered the project. The only Planet Movies location to actually open, a 30 screen megaplex, did so in the summer of 1999 at Easton Town Center in Columbus, Ohio. The location was also located alongside an Official All Star Café and Planet Hollywood restaurant. The continued poor financial performance of Planet Hollywood led the company to declare bankruptcy in December 1998, and even before the first location had opened stated that "the joint venture has no definitive plans to expand this concept once the Columbus site is completed". As Planet Hollywood was preparing to emerge from bankruptcy in October 1999 their re-organization plan emphasized focus back on their core restaurant business and away from side-ventures like Planet Movies and their Cool Planet ice cream chain. The Planet Hollywood restaurant and All Star Café in Columbus were closed in late 2000, and the film memorabilia were also removed from the theater as it was rebranded AMC Easton 30, and continues to operate. The Planet Movies by AMC joint venture was formally dissolved on January 9, 2001. Both of the Disney Parks in the United States at one time included AMC movie theaters at their Downtown Disney sections: AMC Dine-In Disney Springs 24 all-stadium-seating megaplex with Dolby Cinema and Dine-In Theatres (opened in 1996) (formerly AMC Pleasure Island 24) at Walt Disney World Resort and AMC Downtown Disney 12 at Disneyland Resort stadium-seating multiplex (opened in 2001, closed in 2018). Universal Studios Hollywood also contains an AMC location, called Universal Cinema, an AMC Theatre, that in the past was a Cineplex Odeon. Today, it is an all-stadium-seating megaplex and has 19 screens, including IMAX. At Universal Studios Orlando, AMC has the Universal Cineplex 20 (also a former Cineplex Odeon). AMC Independent (also known as AMCi) is an AMC film distribution program that aim to help independent filmmakers get their films in front of theatrical audiences. The program was announced in 2010 via the AMC Blog  and has been responsible for promoting and distributing all independent films to AMC theaters since. In March 2002, AMC bought General Cinema Corporation, which added 66 theaters with 621 screens to the company assets, as well as Gulf States Theaters, which had five theaters with 68 screens in the greater New Orleans area. In late 2003, AMC acquired MegaStar Theatres, adding additional theaters in the Atlanta and Minneapolis–St. Paul markets. On January 26, 2006, AMC merged with Loews Cineplex Entertainment to form AMC Entertainment; the deal brought in AMC's fold of the entire Loews and American Cineplex chains, along with Magic Theatres (named after NBA player Magic Johnson) and Star Theatres, based in Metro Detroit. In 2010, AMC acquired Chicago-based Kerasotes Showplace Theatres, LLC for $275 million, combining the nation's second and sixth largest movie theater chains, except for the Showplace 14 in New Jersey and the Showplace ICON theatres. In December 2015, Starplex Cinemas was sold to AMC for approximately $175 million. Most of these theaters now operate as AMC Classic as of July 2017. On March 3, 2016, AMC announced its intent to acquire Carmike Cinemas in a $1.1 billion deal, pending regulatory and shareholder approval, which would allow it to overtake Regal as the United States' largest movie theater chain. The merger officially closed in December 2016. In July 2016, UCI & Odeon Cinema Group was sold to AMC for approximately $1.21 billion, subject to European Commission approval. The acquisition was approved by the European Commission and the deal closed in November 2016. In January 2017, Nordic Cinema Group, the leading movie theater operator in the Nordic and Baltic area, was sold to AMC for approximately $929 million. The deal was completed in March 2017 after AMC receiving clearance from the European Commission. The early versions of stadium-style seating as built in 1995 had auditoriums configured with an entrance to a flat area in front of the screen for wheelchair users; persons sitting there had to either lean back or look up at an uncomfortable angle to see the screen. Able-bodied guests had to ascend the stairs to sit in the middle of the risers in order to have a comfortable line-of-sight with the screen. Since some wheelchair users may have limited neck movement range, this configuration made AMC a popular target for Americans with Disabilities Act (ADA) lawsuits. AMC subsequently solved the problem in newer theaters by building full-stadium auditoriums where the main entrance is through a ramp that emerges onto a platform in the middle of the risers so that wheelchair users can enjoy optimal line-of-sight. However, the U.S. Department of Justice sued the company and obtained an order requiring AMC to retrofit over 1,990 screens in 95 multiplexes and megaplexes across the United States. The company successfully appealed the order to the U.S. Court of Appeals for the Ninth Circuit, which ruled on December 5, 2008, that the order was grossly overboard and violated AMC's due process rights under the Constitution of the United States. AMC won by pointing out that the United States Access Board had not yet amended its guidelines for movie theaters to specifically require theaters to provide wheelchair guests sightlines that were as good as those from elevated risers, versus merely providing an unobstructed view of the screen. Therefore, the court ruled that it was unfair to AMC to retroactively hold it to a standard which did not exist at the time it began building stadium-style theaters. The original appearance of AMC Citywalk Stadium 19 with IMAX in Universal City, California. It was rebranded and renovated as "Universal Cinema an AMC Theatre" in 2017. ^ a b c d "AMC Entertainment Holdings, Inc. Announces Fourth Quarter and Year-End 2017 Results" (PDF) (Press release). Leawood, Kansas: AMC Entertainment Holdings, Inc. 1 March 2018. Retrieved 2 June 2018. ^ a b "AMC Entertainment, Form 10-K, Annual Report, Filing Date December 31, 2017". sec.gov. Retrieved 6 September 2018. ^ Lieberman, David (December 21, 2016). "AMC Entertainment Closes Carmike Cinemas Acquisition". Deadline Hollywood. Retrieved December 21, 2016. ^ Szalai, Georg (December 21, 2016). "AMC Theatres Closes Carmike Cinemas Acquisition to Become Largest U.S. Exhibitor". The Hollywood Reporter. Retrieved December 21, 2016. ^ "Gerety Will Join Cinema Theaters." Dallas Morning News, 28 October 1948, p. 4. ^ La Franco, Robert. "Coming soon: a megaplex near you." Forbes, August 12, 1996, p. 133. ^ "Durwood legacy packs 'em in." Variety, March 16, 1998, p. 42. ^ a b Klady, Leonard. "AMC founder dies of cancer at 78." Variety, July 19, 1999, p. 40. ^ Nan Robertson, "Multiplexes Add 2,300 Movie Screens in 5 Years"", The New York Times, November 7, 1983, C13. ^ Wilonsky, Robert (September 1, 2011). "So, the Old AMC Grand 24 Will Remain a Movie Theater After All. Half of It, Anyway". Dallas Observer. Retrieved August 13, 2018. ^ "AMC Forum 30". AMC Forum 30 Theaters. Retrieved March 5, 2019. ^ "AMC Theatres, Form 8-K, Current Report, Filing Date Jul 22, 2004" (PDF). secdatabase.com. Retrieved Jan 4, 2013. ^ "AMC Theatres, Form S-1, Filing Date May 9, 2006" (PDF). secdatabase.com. Retrieved Jan 4, 2013. ^ "AMC Theatres, Form 8-K, Current Report, Filing Date May 4, 2007" (PDF). secdatabase.com. Retrieved Jan 4, 2013. ^ "AMC Theatres, Form 8-K, Current Report, Filing Date Jul 14, 2010". secdatabase.com. Retrieved Jan 4, 2013. ^ "Sales Leads - Company Info - Industry Analysis - Hoovers". ^ "AMC Theatres, Form 8-K, Current Report, Filing Date Feb 24, 2009". secdatabase.com. Retrieved Jan 4, 2013. ^ "AMC Set To Deploy Sony 4K Digital Projectors | Creative Planet Network". www.creativeplanetnetwork.com. Retrieved 2015-10-22. ^ Taub, Eric A. (March 29, 2009). "AMC to Get Sony Digital Projectors". The New York Times. Retrieved November 12, 2010. ^ "AMC Entertainment Latest to Cross into Missouri as Border War Continues | Multi-Housing News Online". www.multihousingnews.com. Retrieved 2015-10-22. ^ "Madigan: Settlement with AMC Theatres to provide unprecedented access to movies for people with disabilities". The Rock River Times. ^ "AMC Theatres, Form 8-K, Current Report, Filing Date May 21, 2012". secdatabase.com. Retrieved Jan 4, 2013. ^ a b "China's Wanda Group Says It Will Spend Tens of Billions on Entertainment". The Hollywood Reporter. September 4, 2012. Retrieved October 18, 2012. ^ "China firm buys AMC to form world's largest cinema chain". CNN. May 21, 2012. Retrieved May 21, 2012. ^ "AMC Theatres in Canada". Archived from the original on January 16, 2013. Retrieved December 19, 2014. ^ Alonzo, Austin (July 21, 2015). "AMC CEO Lopez resigns". LA Biz. ^ "AMC Entertainment Taps Adam Aron as CEO". Variety. Retrieved 2015-12-15. ^ Merced, Michael J. De La; Cieply, Michael (2016-03-03). "AMC Deal for Carmike Would Create Biggest U.S. Theater Chain". The New York Times. ISSN 0362-4331. Retrieved 2016-09-19. ^ Times, Los Angeles. "AMC makes final $1.2 billion bid for Carmike Cinemas". latimes.com. Retrieved 2016-09-19. ^ "AMC to drop Carmike brand, add AMC Classic brand for smaller, less-visited theaters". Kansas City Star. Retrieved 1 March 2017. ^ "AMC Entertainment CEO Talks Up Premium VOD & Rebranding Plans". Deadline Hollywood. Retrieved 1 March 2017. ^ Lang, Brent (2017-08-01). "AMC Stock Plunges 26% After Cost-Cutting Announcement". Variety. Retrieved 2017-08-02. ^ Kot, Jan (2018-09-18). "Wanda Sells $600M Stake in AMC as Investment Retreat Continues". www.mingtiandi.com. Retrieved 2019-02-11. ^ Sarah Mock (12 April 2016). "Dolby Cinema AMC Prime Video Wall" – via YouTube. ^ "PRIME at AMC". www.amctheatres.com. ^ "AMC Theatres - movie times, movie trailers, buy tickets and gift cards". www.amcentertainment.com. Retrieved 22 September 2018. ^ a b "AMC Entertainment, Form 10-K, Annual Report, Filing Date May 25, 2012". secdatabase.com. Retrieved Jan 4, 2013. ^ "AMC Stubs - Collect Memories. Get Rewards". www.amctheatres.com. ^ McNary, Dave; McNary, Dave (2018-11-05). "AMC Stubs A-List Subscription Hikes Prices in Number of States". Variety. Retrieved 2019-03-13. ^ "MacGuffins Bar and Lounge". www.amctheatres.com. ^ "FAQ Tickets and Passes". www.amctheatres.com. Retrieved 2019-03-13. ^ "AMC Theatres - Exchange Ticket Terms". www.amctheatres.com. Retrieved 2015-10-23. ^ "Atom Tickets - AMC Age Policy". Atom Tickets. ^ "AMC Theatres® Announces New Branding for AMC Locations in the United States". www.businesswire.com. ^ "Universal Cinema Opens at CityWalk Hollywood During Star-Studded Ceremony". Theme Park Adventure. 25 April 2017. ^ "Investor Relations - Corporate Profile - AMC Theatres". www.investor.amctheatres.com. Archived from the original on 2013-07-31. Retrieved 2015-10-23. ^ "AMC Entertainment to Convert Entire Circuit to Digital Cinema Projection with Sony 4K Systems". 2009-03-30. Archived from the original on 2009-04-15. Retrieved 2009-04-06. ^ "AMC ETX - Breathtaking Sound. Incredible Picture Resolution. Colossal Wall-to-Wall Screen". ^ Macaulay, Scott. "AMC Announces "AMC Independent" - Filmmaker Magazine". ^ "AMC's Nikkole Denson-Randolph Keeps Indie Filmmakers in Focus". 19 April 2012. ^ "AMC Theatres, Form 8-K, Current Report, Filing Date Mar 19, 2002". secdatabase.com. Retrieved Jan 4, 2013. ^ "AMC Theatres, Form 10-Q, Quarterly Report, Filing Date Feb 5, 2003" (PDF). secdatabase.com. Retrieved Jan 4, 2013. ^ "AMC Theatres, Form 8-K, Current Report, Filing Date Dec 19, 2003". secdatabase.com. Retrieved Jan 4, 2013. ^ "AMC Theatres, Form 8-K, Current Report, Filing Date Jan 27, 2006" (PDF). secdatabase.com. Retrieved Jan 4, 2013. ^ "AMC Theatres, Form 8-K, Current Report, Filing Date May 25, 2010". secdatabase.com. Retrieved Jan 4, 2013. ^ "Dallas movie theater operator Starplex Cinemas sold to industry giant AMC for $175 million". Dallas News. Archived from the original on 2015-12-30. Retrieved 2015-12-30. ^ "AMC's Deal for Carmike Cinemas Boosts Chinese Control of U.S. Theaters". The Wall Street Journal. Retrieved 4 March 2016. ^ "AMC Theatres Closes Carmike Cinemas Acquisition to Become Largest U.S. Exhibitor". The Hollywood Reporter. Retrieved 2017-11-20. ^ "Odeon & UCI cinemas sold to China-owned firm - BBC News". BBC News. July 12, 2016. Retrieved July 12, 2016. ^ Szalai, Georg (November 17, 2016). "AMC Theatres' Odeon & UCI Acquisition Gets EU Approval". The Hollywood Reporter. Retrieved November 27, 2016. ^ Lieberman, David (2016-11-16). "AMC Entertainment's Acquisition Of Odeon & UCI Clears European Commission". Deadline Hollywood. Retrieved 2017-11-20. ^ "AMC Entertainment Holdings, Inc. Signs Definitive Agreement to Acquire Nordic Cinema Group". Nordic Cinema Group. January 23, 2017. Retrieved January 28, 2017. ^ Frater, Patrick (January 23, 2017). "Wanda Expands Global Theater Reach as AMC Pays $929 Million for Nordic Cinema". Variety. Retrieved January 28, 2017. ^ "AMC Entertainment Holdings, Inc. Completes Acquisition of Nordic Cinema Group". Business Wire. March 28, 2017. Retrieved November 20, 2017. ^ "AMC Theatres, Form 10-Q, Quarterly Report, Filing Date Feb 13, 2009" (PDF). secdatabase.com. Retrieved Jan 4, 2013. Wikimedia Commons has media related to AMC Theatres.